Backed by profound industry experience, we have been engaged in offering a vast variety of Table Top Freeze Dryer. Freeze dryers facilitate long term preservation of goods after freeze drying processing. Products can be restored to the original shape and form after being hydrated with specific biochemical reagents. It uses forced-air cooling condensation type refrigeration system. The transparent drying chamber allows monitoring the entire process of freeze-drying. 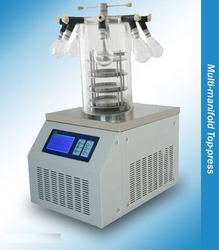 Multi Manifold Regular Desktop Freeze Dryer is applicable for freeze-drying test of laboratory samples and suitable for small amount of production. FD-10-MR include the following types: Regular type, Top-press type, multi-manifold T type and multi-manifold Top-press type. Table Top Freeze Dryer is applicable for freeze-drying test of laboratory samples and suitable for small amount of production. FD-10-MR include the following types: Regular type, Top-press type, multi-manifold T type and multi-manifold Top-press type.